Last night Stuart and I went to see Peter Pan at the Regent's Park Open Air Theatre. Starring Hiran Abeysekera as Peter, Kae Alexander as Wendy and David Birrel at Captain Hook this was a masterful production of J. M. Barrie's timeless classic. In fact the best production I have ever seen of this show. It was theatrical, moving and very funny. Starting off in a World War I army hospital full of injured soldiers the action soon took us to Neverland with all it's child-like wonder of flying boys, mermaids and gruesome pirates. The magical production reflected perfectly the magic of the world of Tinkerbell, the Lost Boys and the ticking crocodile. Hospital beds became flower beds, real bombs turned into water bombs, and the yearning for their mothers back home resonated with the 'little soldiers' in both worlds. 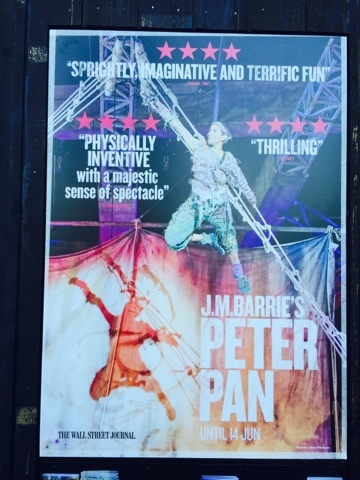 This production flew - much like Peter Pan did - high above the stage. If you get a chance to go. Do!